Brent Raymer picked up the 4th last-place finish of his NASCAR Camping World Series career in Wednesday’s O’Reilly 200 at the Bristol Motor Speedway when his #65 County Building Centers / Trans Pecos Trucking Chevrolet fell out with electrical problems after 3 of the race’s 200 laps. Since then, Raymer has made one other start for owner Joey Sonntag, driving his #65 Chevrolet to a 29th-place finish at Nashville. Wednesday’s race at Bristol would be Raymer’s second start of the season for Sonntag. Raymer qualified for the race at a speed of 117.862 mph, edging Jennifer Jo Cobb and Norm Benning for the 36th and final spot in the field. He pulled behind the wall after three laps of the race, followed a lap later by current 2011 LASTCAR Truck Series leader Mike Garvey in the #93. *The last time Raymer finished last in a Truck Series race was in the 2009 Built Ford Tough 225 at Kentucky, where the rear end on his #85 Car Truck & RV / BrentRaymer.com Ford failed after the opening lap. It was Raymer’s second consecutive last-place finish. It’s also his second consecutive last-place finish after starting in last place. *The #65 has not finished last in a Truck Series race since 1999, when Milan Garrett’s Champion Wheel Ford lost its engine after 13 laps of the 1999 Dodge California Truck Stop 300 at Mesa Marin Raceway. 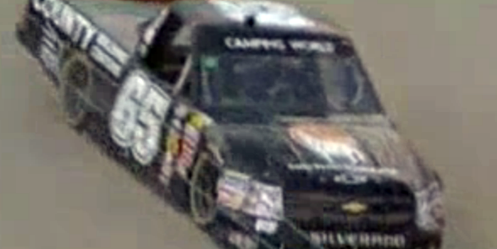 *The #65 has finished last in a Truck Race at Bristol one other time, when Kenny Allen’s Petroleum World Chevrolet was involved in a crash after 4 laps of the 1997 Loadhandler 200.